Congratulations to the 2019 Green Cougar Award Winners! Come meet the winners and learn more about sustainability at the 2019 Sustainability Fair! What are the Green Coug Awards? 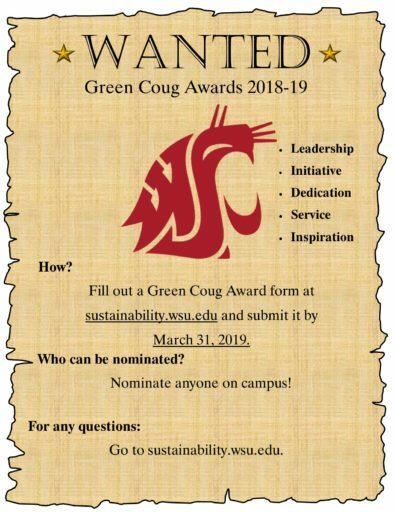 Green Coug Awards are sponsored by WSU Sustainability Office and the Sustainability and the Environment Committee (SEC). 2019 is the first year for the awards and will establish a solid foundation for the future of the Green Coug Award. Who can be nominated and who can nominate? 1) Ask the person if you can nominate them. 2) If they agree, fill out the nomination form available below. 3) Third, submit form to sampsonj@wsu.edu. 4) Congrats, you’ve done it! Finalists will be decided by the Sustainability and the Environment Committee (SEC). Award nominations are due by March 31, 2019. The finalists are presented a Green Coug Award at the annual award ceremony during the Sustainability Fair and winning efforts will be highlighted on the Sustainability Office website. Thank you for taking the time to nominate a person that is making a difference!